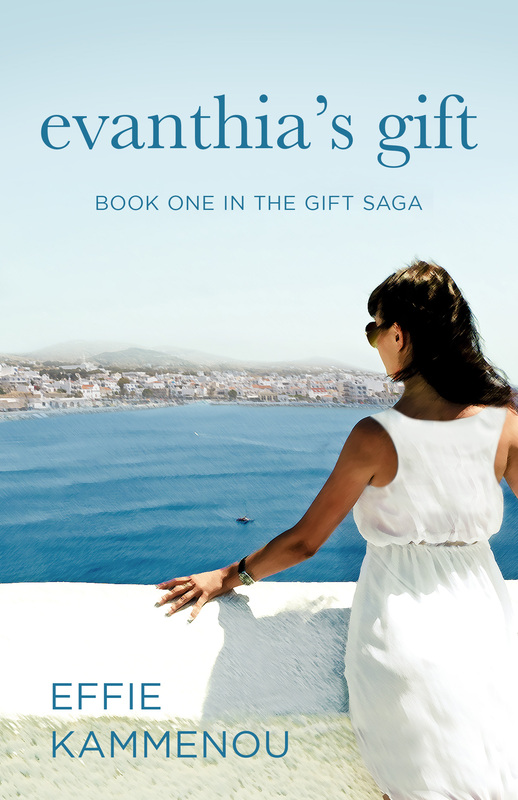 IN THIS CHAPTER OF EVANTHIA’S GIFT, ANASTACIA IS VENTING TO HER MOTHER ABOUT HER JOB, AND NOT BEING OFFERED THE POSITION SHE WAS TRAINED FOR. Anastacia added spices to the chopped meat as Yiayiá grated onions into a bowl. “I wouldn’t know about these things. I never worked. My work was my children. That was enough for me.” She added the onions to the meat mixture, the strong odor wafting up and causing tears to well in the corners of her eyes. Ignoring the sting, Yiayiá added two eggs and dug her hands into the meat, mixing the ingredients thoroughly. She walked to the sink, washed her hands and turned around to face her daughter. “The past is past. Start fresh. It is no good to have hate in your heart,” her mother cried. Yiayiá knew her daughter would not change her mind and she couldn’t blame her. Ana was a kind and giving person, loved by all who knew her. She never uttered a harsh word to a soul, even if they treated her unfairly, but Irini had pushed her too far. Anastacia cut her sister out of her life, plain and simple. It was self-preservation. Aside from their difference of opinion over Irini, Ana and Yiayiá treasured the time they spent together and would miss each other terribly when she returned to Greece. They continued to roll and fry the keftethes in silence, both of them too stubborn for further conversation. Combine all ingredients. Mix well. Form each ball to the size of a golf ball. Roll in flour and press down gently. Fry in a combination of half vegetable oil and half olive oil until brown on each side. 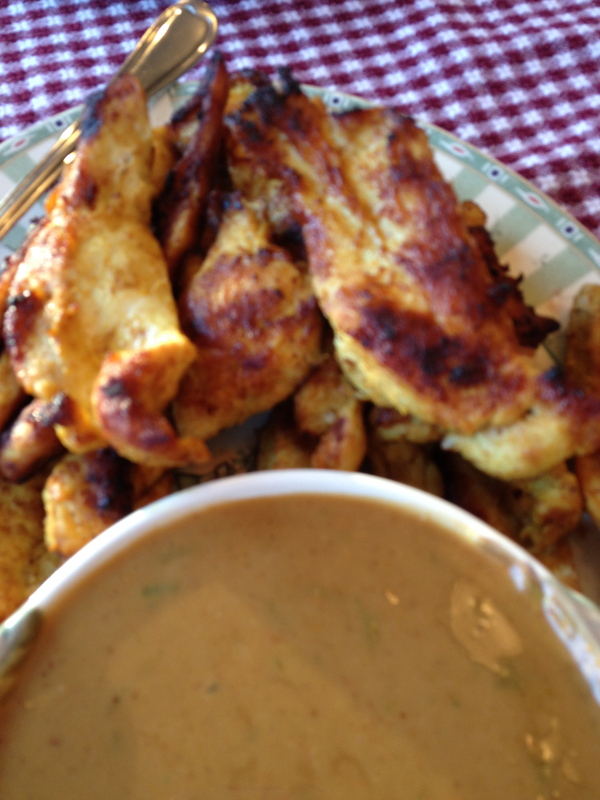 Serve with tzatziki sauce. 2 cucumbers- peeled, cored from seeds and finely grated. Press through strainer to dry. The cucumber will make the sauce loose and runny if you skip this step. Mix all ingredients together with a whisk. Chill before serving. Serve with souvlaki or keftethes. It also makes a refreshing dip. Make this a day ahead and the flavors will intensify. 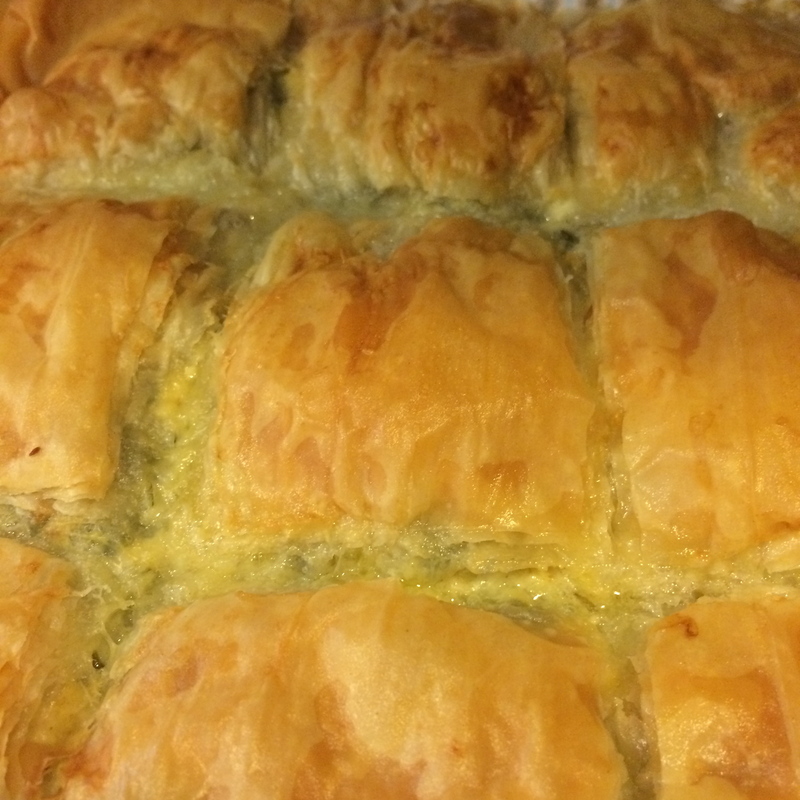 “While the tsoureki is in the oven I will show you how to make tiropita.” Sophia instructed her daughter on forming perfect triangles of phyllo dough stuffed with a feta cheese mixture. I remember doing this with my mom, although she gave me the prep jobs. I never got to do what I called “the fun stuff.” I aways had to squeeze oranges, or run back and forth to the pantry. It wasn’t until I was much older that she trusted me to shape the koulourakia or fold the tiropita into triangles. But thanks to her, I have her love of cooking and baking. She always told me to hug and kiss my food – love it – never rush it. Thanks to her recipes, a part of her is always with us, as well as the heritage we are proud of. Tiropita has to be the easiest appetizer or meze to make. I prepare and freeze them to have on hand when unexpected company comes, or when we have a spur of the moment gathering. Cut the filo into 2 – 3 inch wide strips. Mix feta, egg yolks, nutmeg and herbs in a bowl until smooth. Using 3 sheets of filo strips, place 2 tablespoons of cheese mixture at one end and fold into triangles. Brush the triangles with a butter using a pastry brush and place on a parchment lined baking dish. Bake at 350 degrees for 20 minutes or until golden brown. * To freeze for future use, store before brushing with butter. There is no need to thaw, simply place them in the oven as directed. Today, My dear friend Lita Smith-Mines, Editor-in-Chief of BOATING TIMES LONG ISLAND MAGAZINE, informed me that today is National Cheese Lovers Day. Certain that if she went on my blog she would find a “cheesy” post to add to her Hungry Boater App page, she found a recipe for French onion soup topped with gooey melted cheese. If I only knew about this day—one so important to a person like myself—a self-proclaimed cheesaholic. So, in honor of this day—I give you saganaki. So what exactly is saganaki? Saga-what? It sounds Japanese, but it’s not, It’s a Greek appetizer made from pan-fried cheese. The way to make this depends on where in Greece the cook is from or what restaurant you go to. My mother insisted her way was the authentic way. But that’s an Athenian for you. She took an inch thick slab of kasseri or kefaloteri cheese and dipped it in egg and flour. She would then fry it in a hot olive oil, just enough to coat the pan. When the first side was golden, she flipped it over and waited for that side to turn a golden color. Transferring it onto a plate, she squeezed fresh lemon on the cheese and sprinkled it with oregano. It’s quick, it’s simple, and it’s heaven. Many years ago I went to a Greek restaurant and ordered the saganaki. When it arrived it didn’t look like the saganaki I was used to, but it was delicious. It was more like a dip or a casserole. I often make this when I entertain. It is easy to prep ahead and great to serve to a crowd. For this version thinly slice tomatoes and onions. Pat dry the tomatoes and set them aside while I parboil the onions. Drain and dry the onions. 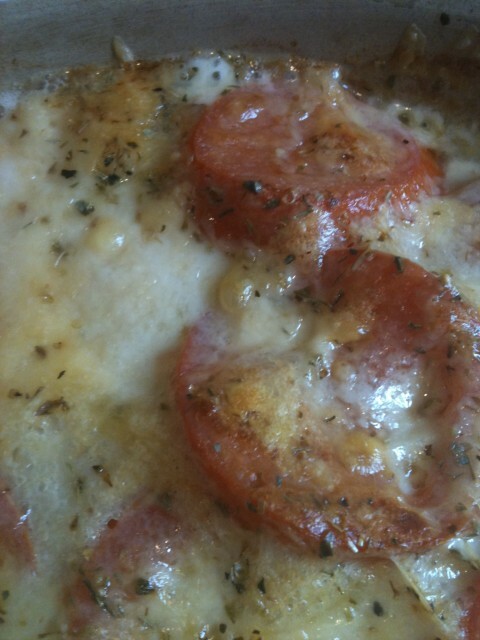 In the bottom of a baking or casserole dish place the onions and tomatoes. Sprinkle with salt, pepper and oregano. Grate the kasseri or kefaloteri in shreds and generously lay over onions and tomatoes. Sprinkle lightly with oregano. Bake in oven at 400 degrees until the cheese bubbles and begins to turn golden. Serve immediately with crusty bread or pita. Some restaurants present this dish flambéed. It’s great for dramatic effect—shooting flames, a couple of shots of ouzo and maybe break a few plates for good luck. At the EPCOT Food and Wine Festival participants can sample food from over thirty countries. Each country has a tiny building or kiosk to represent it. In “Greece,” I sampled a version of saganaki in a way I never had before. They simply griddled a slab of cheese until it crusted on both sides. To finish it, they drizzled honey and roasted pistachio nuts on top. That’s it! It tasted like a sweet and savory dessert. I replicated it at home and discovered it was still easier to egg and flour the cheese. I tried it without the egg and flour and the cheese just melted all over the pan. Now for the real dilemma. How do I decide which way to prepare it when each way is equally delicious? I am hanging on to the last days of summer. I refuse to share recipes for soups or anything that has to be cooked in an oven until it is officially fall and the weather is chilly. I know many of you are treasuring your last days at the beach or a boat excursion on the water before you winterize your boat. For me, it’s a sad day when the pool cover goes on and the patio furniture is put away—no more summer entertaining. But while I can, I am still grilling and making summer salads. For outdoor dining, whether it’s a backyard party, a picnic at the beach, or a day on the boat, I like to bring foods that will not spoil. 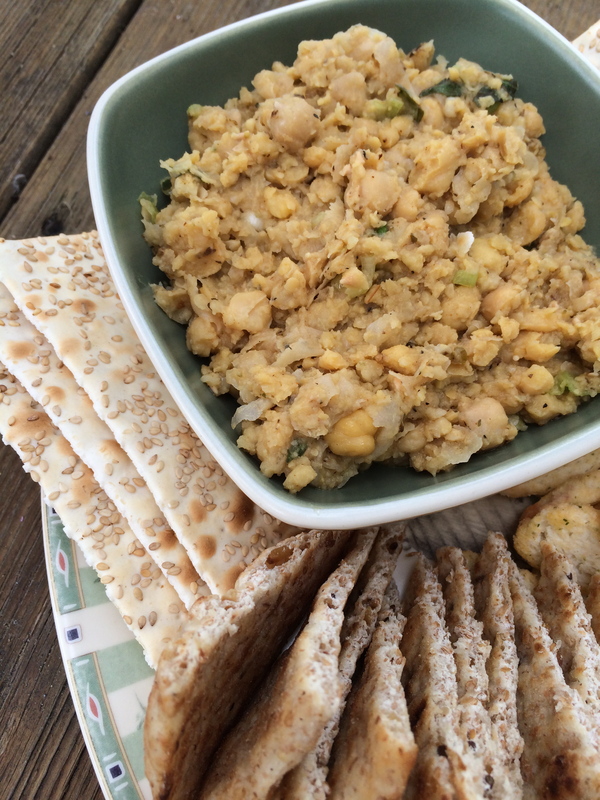 Both the Chickpea spread and the Black bean and corn salad are quick and easy to make. Mix them into a salad or fold them in a wrap or pita pocket. 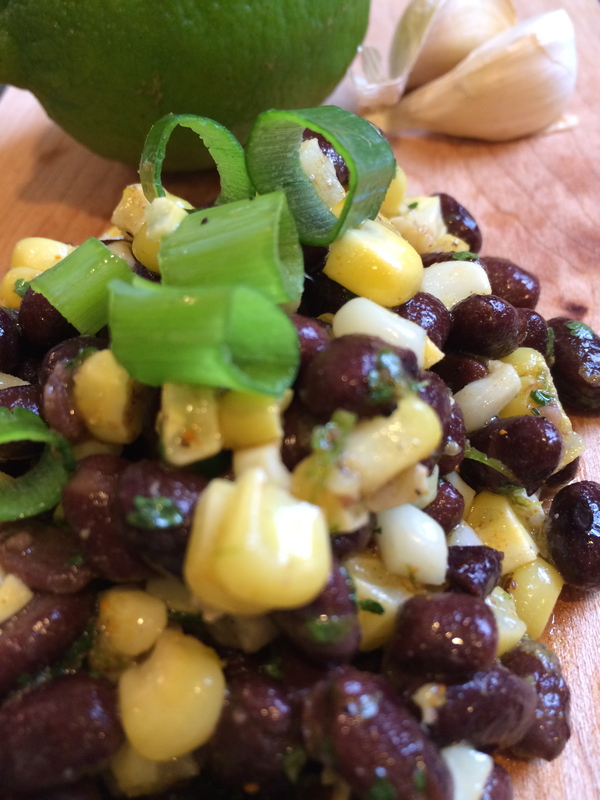 The black bean and corn salad is a great side dish and the chickpea spread is delicious as an appetizer with pita or crostini toasts. The truth is, I don’t only make these salads in the summer. My family likes them so much I make a batch of each every couple of weeks. Mix all the ingredients in a large bowl. The texture of this is not smooth. It is mashed, but lumpy. Some of the chickpeas will get mashed and some will stay whole. Do not use a blender. I used a pastry blender. It’s an unconventional use for this tool, but it works great. If using the fresh corn, boil for three minutes, then allow to cool. Cut the corn off the cob and place in a large bowl. Add the rest of the ingredients. I suggest adding the salt, pepper and herbs slowly. Taste and add as needed. Trust your preferences. If you hate cilantro – try parsley instead. If you want more heat – add more pepper. Hint*- The fresh corn makes a huge difference and…we are in prime corn season! So what is the difference between the various yogurts? A few things. Regular yogurt is looser and very watery. Greek yogurt is thicker and shouldn’t need to be drained. I suggest the Fage brand if you buy it from the supermarket. Real authentic Greek yogurt is very thick. 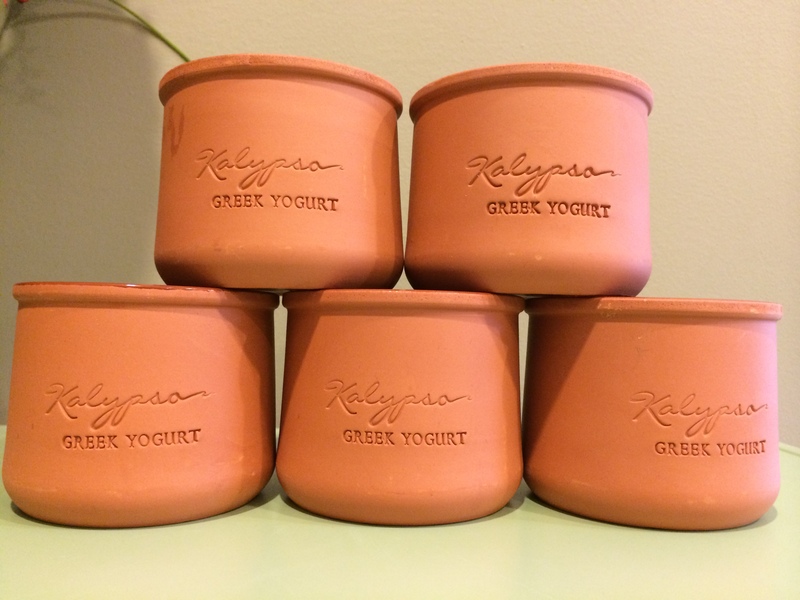 Scoop the Kalypso out with a spoon and turn it upside down—the yogurt will stay on the spoon. Also, all natural ingredients must be used. No preservatives—no hormone and antibiotic infested milk. It does make a difference. 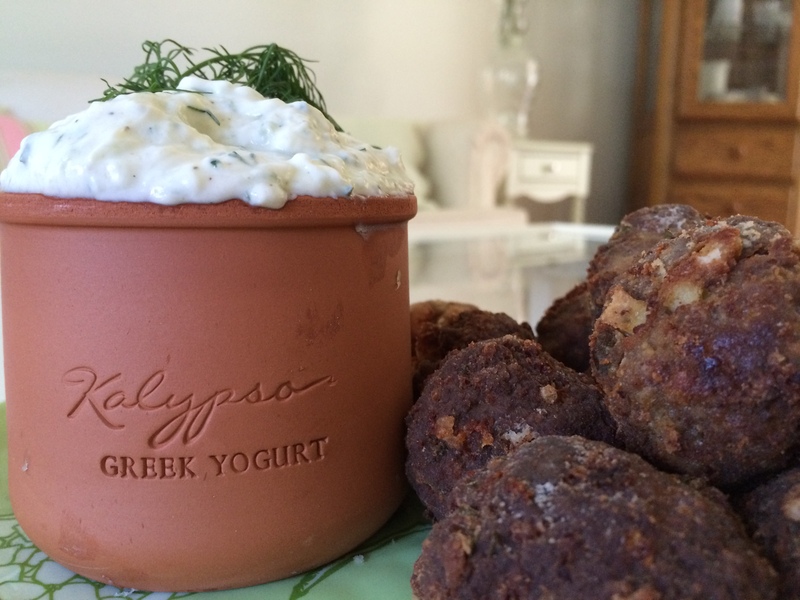 Kalypso has taken pains to not only make the recipe authentic, but to also package their product in a manner that keeps with tradition. 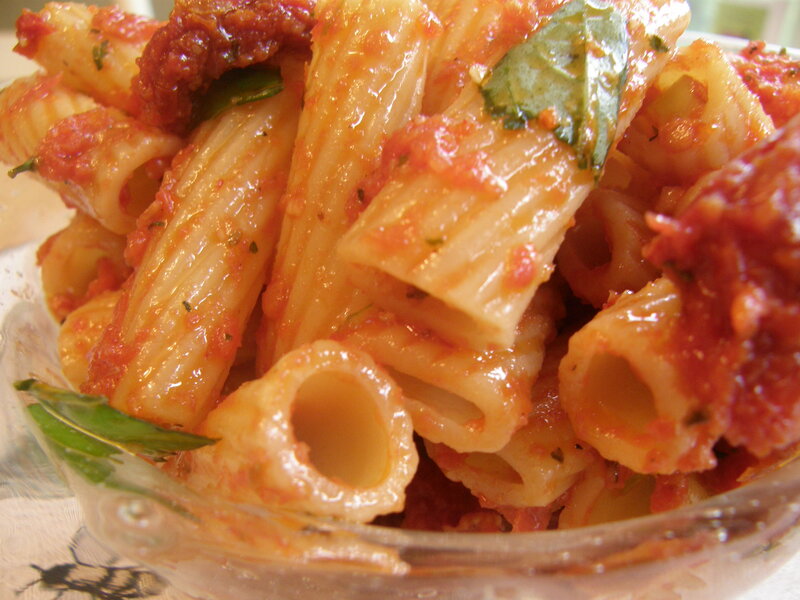 Each serving comes in a reusable terracotta pot. No worries about plastic leaching, or the taste of plastic tainting the freshness of the yogurt. If you don’t have a Farmer’s Market nearby, you can go on to kalypso.com to find the nearest market to purchase their product. Over the last several weeks, I’ve gained a collection of these little clay pots. There are so many things I can think of to do with them. They are great to fill with salsa or dip and put out with chips. A mini herb garden on my windowsill in the winter would be an ideal use. Or insert a citronella votive candle inside and scatter around the patio tables. I have an idea for Thanksgiving that will be perfect for the terracotta pots—you’ll have to wait until then to find out what it is. * Use fresh herbs whenever possible. The difference in taste is noticeable. Combine all ingredients. Mix well. Form each ball to the size of a golf ball. Roll in flour and press down gently. Fry in a combination of vegetable oil and olive oil until brown on each side. Serve with tzatziki sauce on the side. The meatballs can be served warm or cold. * Opt for the fresh dill if you can. ** Prep- Peel and core the cucumbers from the seeds, and finely grate. Press through a mesh strainer to expel the water. The cucumber will make the sauce loose and runny if you skip this step. Mix all ingredients together with a whisk. Chill before serving. Serve with keftethes or souvlaki. Tzatziki also makes a refreshing dip. Prepare it a day ahead and the flavors will intensify. *Greek yogurt is thicker than other yogurts. If you use any other yogurt, you must strain before making sauce.